Visitors to London a century ago would have found plenty of attractions to keep them occupied. From the British Museum to Westminster Abbey, the 1900 publication ‘Baedeker’s Guide: London and its environs’ provides a wonderful overview for railway travellers of all that London has to offer. In addition to descriptions of the main iconic buildings, there is also plenty of detail on the main hotels, shops and parks. St Saviour’s Church (now Southwark Cathedral) is included on account of its medieval origins as an important monastery, as is Lambeth Palace (the London home of the Archbishop of Canterbury), but space is given to little else on what we now term the Southbank. Back then Southwark was the heart of London’s industry – with dirty factories producing goods ranging from vinegar to leather. In the previous century Charles Dickens had written so vividly of the misery that inhabitants endured amongst the pollution (as I have written about before). With conditions so bad, why would anyone visiting London want to get themselves dirty and, quite frankly, risk their lives by crossing the river? Although Baedeker’s Guide notes that Barclay and Perkins Brewery in Southwark is “one of the most extensive establishments of its kind in London, and is well worthy of a visit” visitors were still urged to exercise caution on account of dangerous gases at the site. By the end of World War Two however, Southwark as a bustling industrial suburb was a shadow of its former self. Greater London was still an important centre for manufacturing, but many factories had moved much further away from the City to places like Dagenham, where a new Ford factory was built in the 1930s. Houses and commercial premises on the south bank which had been bombed in the war were falling into dereliction. Then came a welcome development. At a time when the nation was feeling subdued following post war depression, the Festival of Britain of 1951 aimed to revive spirits. Britain was examined in a series of pavilions on the south bank which not only romanticised the nation’s past, but looked forward with optimism to a time where we would all benefit from scientific discoveries and well-designed mass affordable goods. 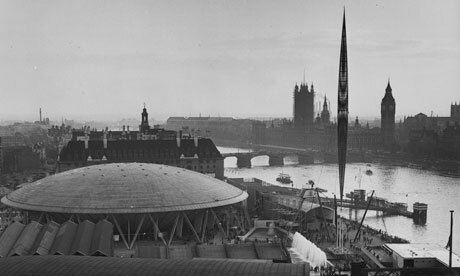 One of the pavillions at the 1951 Festival of Britain (it was demolished, but other structures like the Royal Festival Hall remained and continue to be popular today). But whatever short term injections of optimism that visitors may have gained in 1951 by visiting venues like the Dome of Discovery, the Homes and Gardens Pavilion and People of Britain Pavilion, the longer term impact that regeneration has had on the area is much more significant. Millions of people continue to enjoy the new riverside walk and the Royal Festival Hall, both legacies of the Festival, every year. The Southbank, which also enjoys a host of annual festivals, is a true asset for London and one that puts the capital on the map. Now the Southbank yet again stands at a cross roads, as in recent weeks plans have been announced to bring further transformation to the area. The Queen Elizabeth Hall, Purcell Room and Hayward Gallery will be revamped in a new £120m scheme, bringing the Sixties buildings up to the standard of the older Royal Festival Hall. Comments from the Southbank Centre’s artistic director that the site is “tired and under-nourished” are spot on. Walking around some of the space between these venues can seem like venturing around a gloomy multi-storey car park or an area that is only fit to store bins. Central to the plan is creating a huge raised glass pavilion that will link the Queen Elizabeth Hall and Hayward Gallery, providing more space for showcasing the arts that the Southbank centre has been famous for. People and organisations will, course, have differing views on how the developments should progress. While healthy debate is important for a democracy, it’s crucial that arguments and disagreements don’t stall the process of cleaning up dingy parts of the capital. If London is to remain a truly world-class city, these building projects need to continue. History shows that big schemes can leave last long-term legacies. And for this look further than the Royal Festival Hall. While I support the Southbank regeneration proposals as an individual case (I detest the area as it is), I do fear that it may set a dangerous precedent in our approach to historic building conservation. The Southbank may not be to many people’s taste in its current form, but fashion should not come into consideration in matters of architectural heritage.